▲ Last week I was in Banteay Chhmar , an Angkorian ruins site in the far north-east of Cambodia. I was there with John Sanday, the British archaeologist who has been working on this site for three years now. John was also responsible for a great deal of the preservation work that has taken place in the Lo Manthang (aka Mustang) region of northern Nepal, where I went trekking last year. You haven’t heard of Banteay Chhmar? You will! It’s a big site about 100km in a straight line from the major attractions of Angkor Wat. To get there travel west from Siem Reap to Sisophon, as if you were heading towards Poipet, the border town with Thailand. Then turn north on a rather rough and ready road. Unlike Angkor Wat, which these days can be over-run with tourists, Banteay Chhmar is, as yet, undiscovered. You might be the only visitor in town. 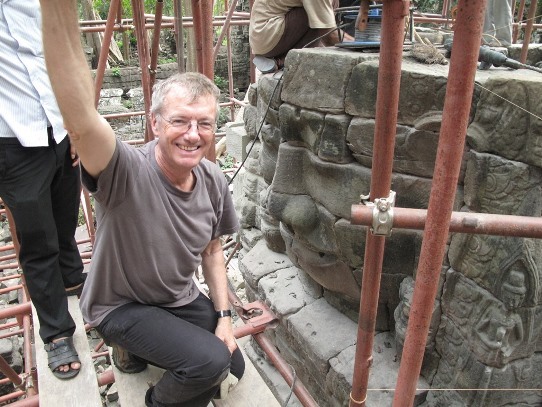 ◄ John Sanday’s work at Banteay Chhmar is sponsored by Global Heritage Fund, an organisation dedicated to archaeological sites in the developing world which don’t top the popularity lists. So no Angkor Wats or Machu Picchus. Plus they’re looking for sites where archaeological protection could also lead to community development. If visitors come to the sites then guest houses, restaurants and employment for a host of local people as everything from tour guides to restoration workers could all develop. I was at Banteay Chhmar with a small group of GHF supporters. ▲ At the moment Banteay Chhmar offers visitors those wonderful Indiana Jones experiences, the feeling that you’re emerging from the jungle to find yourself facing a completely unknown site. It’s a surprisingly large site with reminders of Angkor Wat (long stretches of wonderfully detailed bas reliefs) and the Bayon (those enigmatically gazing ‘face towers’). John’s work so far is rebuilding a stretch of particularly detailed bas relief and Face Tower 18. I’m looking at the work on that face tower in the photograph at the top. ▲ The bas reliefs include a pair of wonderful multi-armed reliefs of Avalokiteshvara (also known as Lokesvara), the Bodhisattva of Compassion. Sadly four others have been stolen by looters, two were intercepted and are now in the museum in Phnom Penh, but the other two are probably on the wall of some Thai general or oligarch’s home. ▲ Visitors may, as yet, be few and far between, but already there are signs of locals catering for them. Visitors can find clean and simple village homestays, like the one I stayed in.